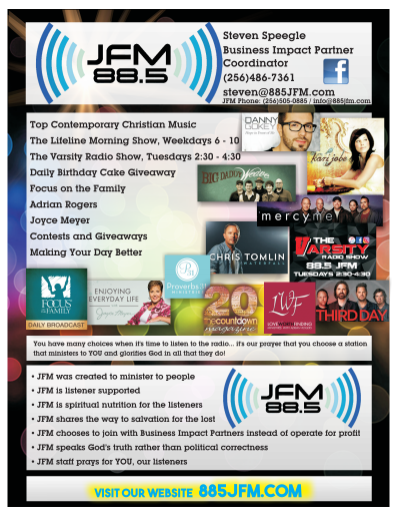 We are Marshall County’s Only Non-Profit Contemporary Christian FM Radio Station. And the beauty of it is, we each have the opportunity to play a part in its existence. We are listener-supported, so we are what you make of us. If you enjoy the programming you hear on our station, if you are empowered by it, if it helps you to grow or maintain your faith in Jesus, than what better way to make it available to others in our community, than by partnering with us? It is simple to do. For individuals, simply click the donate button below. 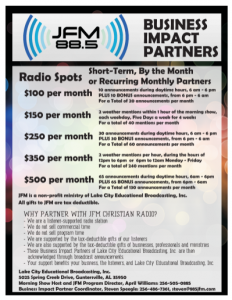 For a list of our current Business Impact Partners, click HERE.